I wonder if the total amount spent on these three categories in ANY MEDIUM is not dropping by at least the same amount? In other words, unlike historic situations where newspapers faced other more traditional competitors that sold advertising space of some kind, what we see now are competitors who charge much less or nothing at all. What that means is that these revenue pipes are running dry and that some other revenue-producing offerings are needed in order for newspapers to retain profitability. That historic profitability has in part paid for the quality of the best reporting. If we don't value that quality enough to pay for it directly as customers (as is the case in some countries overseas; a single copy of the International Herald Tribune now costs more than $2.50, for example), the only option is for newspapers to find some new revenue generating lines of business very fast. Then again, I could have written that admonition years ago, and did. On the bright side, it makes me sure of my decision to resign from a dead-tree pub and go online. You nailed it. And I wish the NAA would stop the spin, which you also rightly pointed out. But I still think Gannett's in play, despite what you wrote in your previous post. What is frustrating is that in almost any market you care to name, the local newspaper is still the best media buy there is. Your subject line, "Print advertising..." is a bit misleading. Print advertising includes magazines. While some categories of magazines have seen advertising declines (B2B, for example), they have not -- as a whole -- suffered the declines reflected in the newspaper statistics you cite. 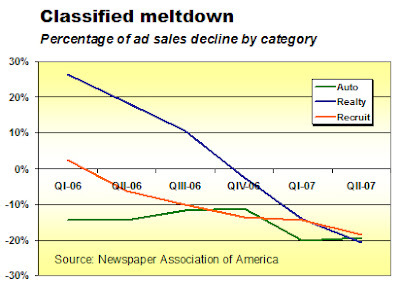 Rex is right that other forms of print advertising are faring better than newspapers -- the more targeted, the better. Because I write mostly about newspapers, I think the context is clear for most readers. Apologies to anyone who was confused. Giving it some thought as an interested outsider, it occurs to me that traditional newspaper publication is at least partially a *distribution* business - that is, the physical papers are still delivered to a fairly large number of point locations throughout a MSA. Granted, this distribution end of the business is costly, mostly lamented in the Internet era, and being scaled down as we speak. But perhaps these attitudes miss the point a bit - namely, that there may be other businesses looking for MSA-centric point distribution that can piggyback on what remains of the newspapers' in-place distribution networks. For instance, the Brits have apparently been using newspapers to *heavily* distribute CD-based music samplers. I don't think I've seen this in the US yet - FSIs of printed materials - yes, of course - for years, but not much else in terms of other materials.